bd808 raised the priority of this task from to Normal. bd808 added projects: MediaWiki-Debug-Logger, Reading-Infrastructure-Team-Old (Don't use). 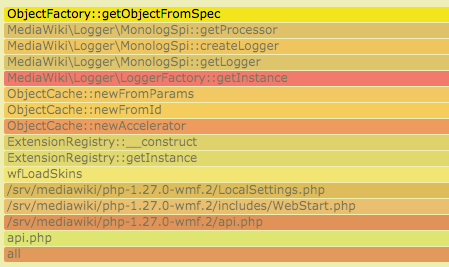 Since ObjectFactory::getObjectFromSpec() isn't showing up on the report, MonologSpi::getLogger() seems the most likely culprit. MonologSpi uses a memoization pattern to cache and reuse as many objects as it can during a request cycle but it does need to build quite a few object instances in order to deliver a fully functional Monolog\Logger instance. 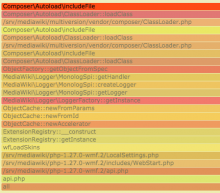 All of these instances are created using ObjectFactory::getObjectFromSpec() which is why I would have expected it to hit the high utilization rather than LoggerFactory::getInstance(), but maybe each call to ObjectFactory::getObjectFromSpec() is fast enough not to get caught on top of the call stack and LoggerFactory::getInstance() just gets blamed because it is wrapping many smaller calls and ending up on top in between each of them? If this was the case however it seems like MonologSpi::getLogger() would really be the one on top of the stack most often. There is also an inverse flame graph at https://performance.wikimedia.org/xenon/svgs/daily/2015-10-22.api.reversed.svgz. 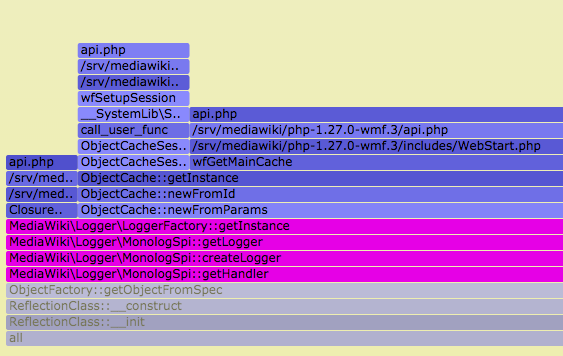 It would seem most calls come from wfDebug (also ObjectCache::newFromParams and wfDebugLog), and LoggerFactory::getInstance itself appears to spend most time (on average) in interface_exists. Monolog doesn't even show up here. This points where I would expect, namely to the creation of new objects as the time sink. Object construction using a specification having both 'class' and 'args' members will call the constructor of the class using ReflectionClass::newInstanceArgs. The use of ReflectionClass carries a performance penalty and should not be used to create large numbers of objects. If this is needed, consider introducing a factory method that can be called via call_user_func_array() instead. The Monolog configuration that we are using in production & beta cluster builds everything using 'class' + 'args' specifications so we are using ReflectionClass::newInstanceArgs a lot in constructing Logger instances. I actually wrote that class and docblock so you'd think this would have dawned on me a bit earlier. Apparently not. PHP 5.6 adds a "splat" operator (...) that would allow getObjectFromSpec to use $obj = new $clazz( ...$args ); instead of reflection. The version of HHVM that we are running in production supports splat so it's probably worthwhile to add support for that to ObjectFactory. It's ugly but gets the job done. Much better! ObjectFactory::getObjectFromSpec and ObjectFactory::constructClassInstance are still showing up pretty high in the results so there may be additional things to investigate but the reduction from 7.73% to 5.29% (2.75% + 2.54%) is encouraging. Logging and ObjectFactory have dropped completely out of the top 10! Monolog\Logger::addRecord should be improved by T116550.